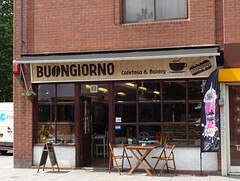 Italian cafe and bakery on Selsdon Road in South Croydon. It sells sandwiches, hot snacks such as arancini and calzone, sweet pastries, biscuits, milkshakes, coffee, loaves of Italian bread, and a small selection of Italian groceries. They have free wifi — ask staff for the network name — and they also have a power socket available for customer use. Accessibility: A very small step to get in (no more than an inch or so). No steps once you're in, including to the toilet. According to an old sign revealed after the departure of Bloomers Bakery photo, at some point in the past it was John Isles, "the bakers larder for quality bread and cakes". By August 2012 it was a bakery and cafe called Bloomers Bakery photo, but this closed down some time between July 2015 and December 2015. As of early January 2016 there was a pile of mail accumulating on the floor and a notice from the landlord stating that the lease had been relinquished. Their main branch was at 273 Lower Addiscombe Road, CR0 6RD; we're not sure if that one closed down too. Some time between January and March 2016, a new bakery/cafe called Brews & Bakes opened photo, but this closed down some time between March and May 2017. Last edited 2019-02-05 10:44:41 (version 37; diff). List all versions. Page last edited 2019-02-05 10:44:41 (version 37).